Although I don’t want to put any tag on myself, I have to admit that I am usually “in the middle”—neither too this nor too that. My background is a “middle” one. Two popular words in China describe girls with different backgrounds. One of them is Baifumei, meaning a young lady who’s white-skinned, rich and beautiful. The other is Nudiaosi, meaning an unpromising girl who’s ugly, poor and badly-behaved. And I am in the middle. I am olive-skinned, plain-looking and always in desire for money, lady-like among strangers while sometimes foolish among friends. My college is a “middle” one. Some people call it “first-level among second-level ones, but second-level among first-level ones”. I may be called a “gold debater” in my own school, but not even a “copper” or “iron” one when I attend national competitions with debaters from many first-level schools. The best Chinese proverb to cite here should be “behind an able man, there are always men beyond”. I live with my middle-aged parents near the middle of our city. They are totally different people when dealing with virtue and money, my father being a typical romantic and my mother being a grudging realist. And I am in the middle. From time to time, I doubt the real motives behind seemingly holy conduct of a person or a country. Influenced by realistic novels and articles, I am often inclined to connect every action to the interest of the actor. But I still believe in love, sympathy and other virtues of mankind. Foolish as it may sound, I’d rather believe there’s sincere love in the world although not everyone may find it during her lifetime. I’d rather believe there’s some virtue and justice, that tops all the human greed and evil. If I’m wrong, I’d rather remain in the wrong. I have two friends, one being so hard-working that she would rush to school the day after Chinese New Year’s Eve, and the other being so carefree that she is still at home right now (she was supposed to go to school a week ago). And I am in the middle. I am constantly industrious because I know success without education happens to legends like Bill Gates (even he was once in college). But part of me also longs for an ordinary life—a plain job, a loving husband, healthy parents and parents-in-law and one or two children who would sit on my legs when I return from work. You can call me greedy because I seem to want both. If that requires more devotion, I am willing; if that is too difficult, I will try to strike a balance. “But isn’t there always a balance to strike,” you may ask, “is it always good to be in the middle?” Maybe not. But being in the middle also means you are neither too far from this nor too far from that. If I must choose an extreme one day, I can take it easy. If I realize I don’t want to be in the middle any more, I can swiftly shift to one side. That’s what makes it hopeful. 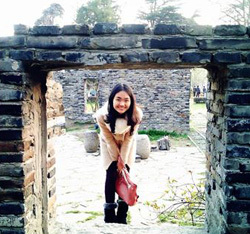 This entry was tagged China, essay, Ginling College, women's education. Bookmark the permalink.